Let’s go back to 1300’s Europe, dark days for the country as the plague began its wide reaching effects upon millions of people. Bodies are burned, the soon to be dead walk the streets, and director Christopher Smith can’t keep his camera still. Maybe the constant swaying is meant to hide the cheapness of the sets, or maybe it’s just there to annoy anyone who is actually trying to focus on the material. Whatever the case, it’s an immediate knock against Black Death, and it’s going to steadily work downhill from here. There are countless scenes of the dead and dying scattered throughout the film as a group of men travel to a town as of yet unaffected to0 see how they’ve escaped death’s grasp. With them is Osmund (Eddie Redmayne), a young monk on the journey only to reconnect with his lost love. Black Death sluggishly moves to its goal, Osmund taken aback by all he sees, then thrust into a village that shares no belief in god. The film then switches gears, the men all proclaiming and sticking to their beliefs in a higher power… and endlessly. Trapped by the villagers whose own beliefs state the plague was brought on by Christians, the men are drugged and then sentenced to death unless they renounce their faith. It’s an interesting parable, one about sticking to your personal understanding, even when faced with certain death, although all of the religious talk goes out the window when the swords begin flying. There’s that tricky rushed ending where Osmund seeks his own revenge too, baffling in terms of everything this movie seems to want to do. This isn’t a complete character arc, Osmund simply meandering around looking for Averill (Kimberly Nixon), under the assumption that the villagers can bring the dead back to life. He becomes confused and disoriented, although he’s then the only character that has any sense of purpose. The rest come off as mindless thugs, out to show their beliefs through their weapons. Black Death is less about the plague than about religious retribution, the disease serving as a rather pointless MacGuffin in the backdrop. The only reason the sickness even comes up is to remind the audience of its horrors, and take a few side characters with it along the way. While many perish, the gore is generally held for the slaughter, including an especially gut churning kill to one of the leads later in the film. Between that, it’s endless walking, a meager, pointless sword fight, more walking, some chatter, and people sticking steadfast to what they believe. The film is empty, hollow, and dull, the type of thing a trailer could have presented with more care as to the pacing. Seemingly shot on a variety of film stocks, Black Death ranges from exceptionally noisy to nearly grain-less. There is no consistency or method at work here, the encode trying to pace itself to keep up as the structure wobbles between cuts. It is intrusive to the visuals, already somewhat murky due to the lackadaisical black levels. One of the opening shots pans up from a rat, the image so dulled and gray there’s no life to it. Maybe that’s the point given the era, although that’s reaching for an answer. 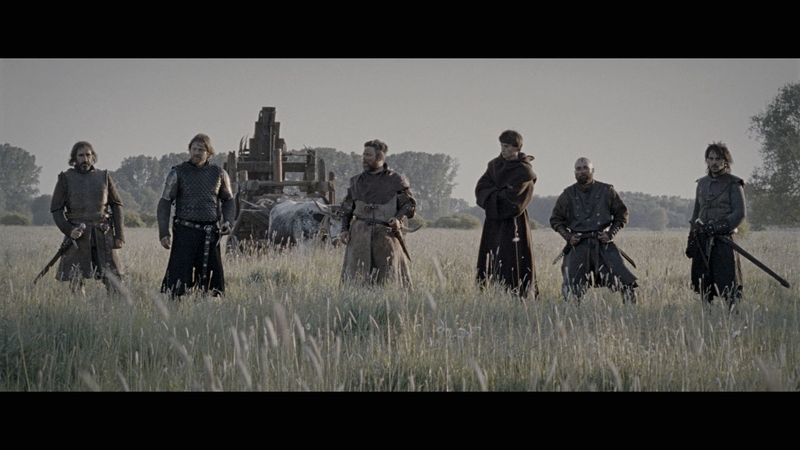 The entirety of the film takes place within a palette of earth tones, muted for effect. Flesh tones make you believe everyone is a victim of the disease, and plant life might as well be covered with soot. That’s more relevant as a style; the black levels? Not so much. Detail struggles about as much as the grain strains to remain stable. The constant camera shifts and shaking don’t help, working against the digital encode to preserve image integrity as motion blur is only exaggerated here. Chain mail, heavy cloth, and environmental shots are the best of the lot, faces mostly flat, smooth, and lacking in terms of texture. This even goes for the grit and blood drenched post-battle close-ups, the definition never coming to this film’s aid. Magnet/Magnolia has been known to take these international pieces and rough them up, Warlords a great example of what they’ll do to a film to make it more “appealing” to an American audience. Black Death doesn’t have any egregious edge enhancement, although suffers from contrast boosting, which may explain the black levels better than anything else. Boisterous drums dominate this score, leading to some spectacular bass as they endlessy pound underneath the action, or signal something dramatic. The score has some weight behind it, as do a few other sound effects, like someone pounding on a door at 2:40. The point is certainly hammered home. Ambiance feels slightly artificial, the plethora of forest insects and birds elevated enough to become more of an annoyance. When the surrounds need to be called on elsewhere, they barely compute, from the echo that should be carried through Sean Bean’s voice at 10:18 to the sword fight about 30-minutes in. Sword clashes and screams of agony split the stereos well, yet never enter the surrounds. For more contrast, the stream running near the characters as they chat at 23:28 is louder than most of the other elements, action included. On a final note, there’s a rather odd electronic beeping starting at 1:01:04. It sounds like it might be part of the score, yet no other theme includes it, there’s no real beat to it, and it incessantly drones on in the surrounds for about a minute. Four deleted scenes, about four minutes worth appropriately enough, begin a small set of extras. Bringing Black Death to Life is your 11-minute making of piece, some of the material repeated through a dozen cast/crew interviews that run 32-minutes in all. Some raw behind-the-scenes footage is appreciated, followed by an HDNet promo, trailers, and BD-Live access.